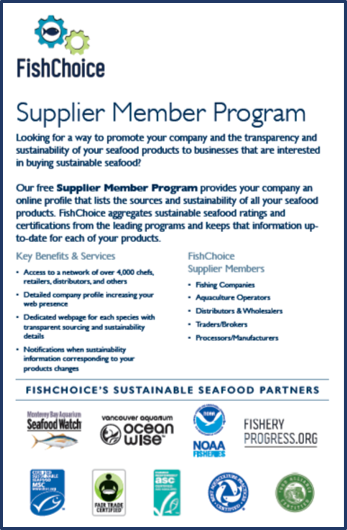 What is a FishChoice Supplier Member? Seafood suppliers become members by working directly with FishChoice to create their supplier profile and to add sustainable seafood products. Once your information is online, seafood buyers have instant access to transparent information on your company and products. For your existing customers, the website is a simple way for them to get up-to-date sustainability information for listed products. Potential customers can contact suppliers either by phone or via an online contact form. FishChoice.com is increasingly becoming the most in-depth resource for seafood company and product information anywhere on the Internet. As a FishChoice Supplier Member your company and products are part of a sustainable seafood information and resource hub that reaches a community of nearly 4,000 seafood professionals. These professionals include individuals from industry, government, academia, and NGOs. Your participation on FishChoice.com contributes to raising awareness of the importance of sustainable seafood. By including your company on FishChoice.com you are demonstrating that you value the importance of environmentally-responsible seafood production. This value will be communicated to your current and potential customers alongside hundreds of other like-minded businesses. Company information - usually the 'About Us' information on your website as well as important policies, etc... regarding sustainability of seafood. We also include distribution area, delivery options, and other information you may want. Product Sources - each listing includes the species, origin(s), and fishing/farming method(s). Products are listed individually by source fishery/fisheries and include all the different forms and sizes that correspond with that source. In some cases this may a single listing for a species, in cases where a species you sell comes from multiple fisheries, it will be separated if the sustainability assessments are different. We are responsible for keeping the sustainability of your products up-to-date based on the source information you provided. Product Details - we want to include product forms, sizes, seasonal availability, minimum order and other information. The goal is to provide as many details as possible so potential buyers know if your product meets their specifications. Activation - once we receive all the information, it usually takes a week or two to add your profile and products to the website. When you are added to the website you receive an email with an onboarding kit that provides details for managing your account moving forward and how to implement your membership. Please fill out this form and we will get back to you promptly.